Have you ever landed your parachute just a little closer to an obstacle than you would have liked? Of course you have. All of us do as we begin to learn how to skydive and fly parachutes. So how do we NOT land too close to or on top of obstacles? We need to understand a number of things… what kind of performance our chosen parachutes provide, how that performance is affected by altitude and current wind conditions, and how to fly our parachutes to maximize that performance and land on target. One thing all novice canopy pilots should do to avoid obstacles is to plan a substantial “buffer zone” around any obstacle–such as planning to land no closer than 50 yards to our property lines, buildings, or the runway. You don’t want to cut it too fine while you are still learning to judge winds and learn how to fly a parachute, because a small error in the wrong direction will put you on or even behind that obstacle, which can be a significant problem especially in windy or turbulent conditions. With a substantial buffer zone, a small under- or over-shoot won’t put you in harm’s way. 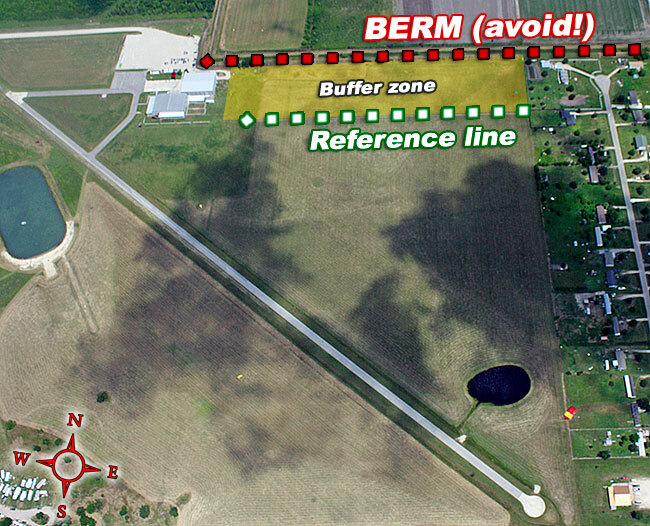 One obstacle we find that jumpers often land too close to is the raised double berm (with a ditch in between) on our north property line along the landing area (see image below). Both in very high and very low north or south winds (landing direction perpendicular to the berm), we often see skydivers over- or under-shoot and land on, very close to, or behind this berm. Not only is this a terrain concern, but if it’s very windy this raised dirt line can provide significant turbulence. To help you avoid this area, we’ve provided you with a buffer zone for it. You may notice on your next jump at Skydive Spaceland that there is now a mowed line in the grass that runs from east to west on the northern side of landing area #2, about 100 yards away from the berm (in line with the fence along the south side of the hangar). This line is a simple, hazard-free ground ‘reference’ line to provide more tools to the novice jumper. References (that are free of obstacles) are wonderful tools to canopy pilots for determining and adjusting their specific patterns and subsequent landings. The area north of this reference line and south of the “berm” should be considered a caution area that you should plan to land south of. If you have any questions about canopy flight and accuracy, please feel free to ask any Spaceland skydiving instructor for tips. Next PostNext What Line Type for My Parachute?